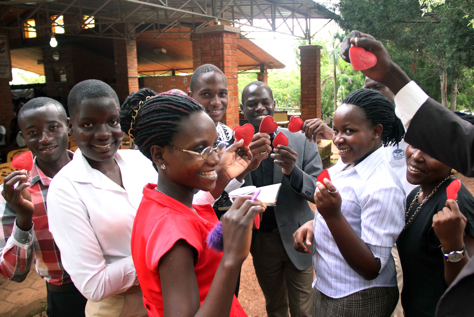 Over 400 students, teachers, and business and NGO representatives came together for a one-day social entrepreneurship workshop at Uganda Christian University in Kampala on September 12, 2015. 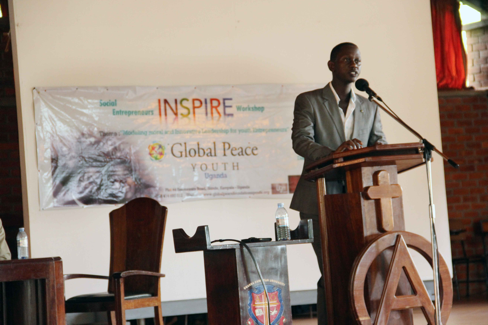 Global Peace Youth Uganda organized the event on the theme, “Modeling Moral and Innovative Leadership for Youth Entrepreneurs,” which focused on equipping young people with the necessary tools to transform their lives in a positive way and engage in civic contributions in their communities. "Modeling Moral and Innovative Leadership for Youth Entpreneurs"
At the workshop distinguished entrepreneurs from Kenya and Uganda spoke about their work experience and offered insights into becoming a successful entrepreneur. Roly Adlam, Founder of Rift Valley Leather (RVL), which assists disadvantaged groups in Kenya, addressed the frequently raised question about the gap between skills and available jobs by posing ethical social entrepreneurship as one solution. Adlam also showcased some leather products and offered marketing representative positions at RVL to ten students upon graduation. Entrepreneurs from Kenya and Uganda offer their experience. The workshop was part of Global Peace Foundation Youth’s U-GEN project, which hosts events and programs for a global network of young leaders who are committed to achieving social change and sustainable development through becoming moral and innovative leaders. The project is currently in Nigeria, Kenya, Uganda and Nepal. The highlight of the workshop was the U-GEN Innovation Board, giving participants a platform to share social entrepreneurship ideas. Through this activity students like Ssenyonga Rogers from Mukono High School felt “ready to make a difference” in her school, and plans on forming a club. Over 400 participants registered as new U-GEN members who pledged support for Global Peace Youth and its activities in the future. After the workshop, students network with fellow participants. The event garnered wide media coverage, including a live broadcast by the Uganda Broadcasting Cooperation Television. Social entrepreneurship is increasingly seen as an effective method of job creation, while also encouraging positive youth engagement around the world.